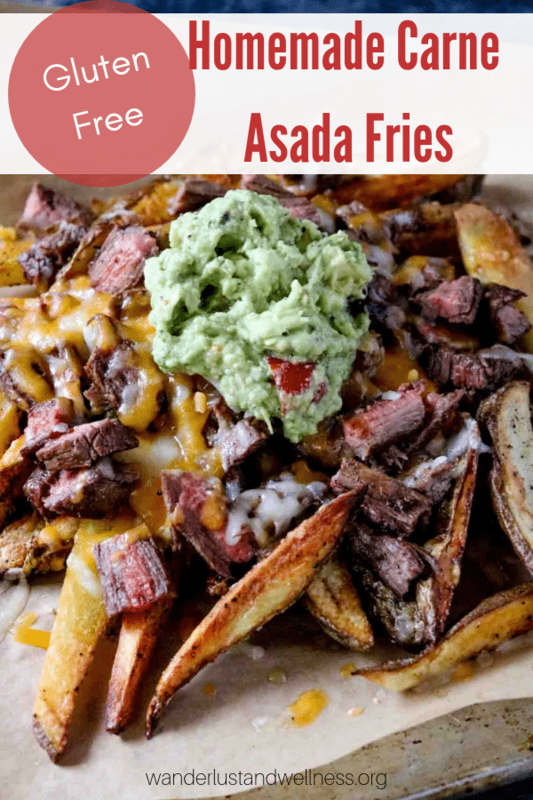 These homemade carne asada fries are a crowd-pleasing appetizer. Naturally gluten-free and easy to make, they’re perfect for your next big party! 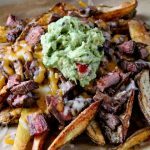 I’ll admit, I’m a sucker for anything Carne Asada, but these fries were AWESOME! Not to mention these fries are homemade, which in my opinion, makes them ten times better than any frozen bag variety. Add on the grilled marinated flank steak, cheese, and guacamole, yowzers, so good! You can make up a big ol’ batch of these for your party and let your guests munch on them throughout the night. To start, marinate the flank steak for just a few hours before grilling to give it an extra boost of flavor. Grill to medium-rare and then set aside to rest. For the homemade fries, slice up your potatoes, leaving the skin on. Brush with olive oil, salt & pepper, and bake. 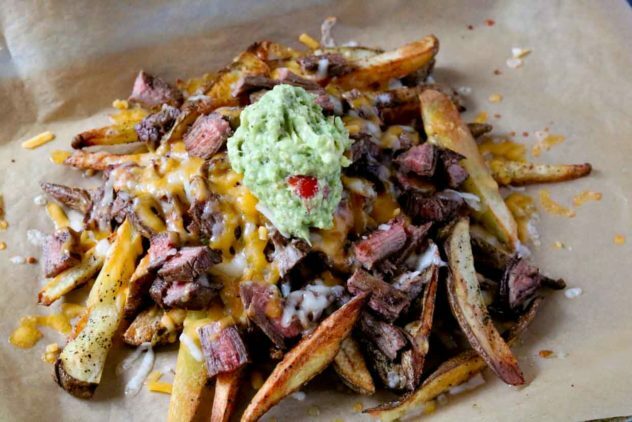 Next, on a lined baking sheet, add a pile of the baked homemade fries, then top with sliced carne asada steak and then top with shredded cheese. Place the baking sheet into the oven and turn to the broil setting. Broil for just a few minutes until the cheese is melted. Top with fresh guacamole and serve immediately. You can swap out any steak variety if you’re unable to find flank steak. If you don’t have time for the homemade fries, you can swap in your favorite frozen bag variety. Need dairy-free? Omit the cheese or use your favorite dairy-free cheddar blend. If you’re unable to grill the steak, you could pan sear the steaks for 6-8 minutes, flipping halfway through. Try these other homemade fries recipes! In a bowl, combine the marinade ingredients and mix well. Add the flank steak and marinade to a Ziploc baggie. Push all of the air out of the bag and seal. Massage the bag so that the steak is well covered by the marinade. Place into the refrigerator for about 2 hours. Slice your potatoes, leaving the skin on, into fries. Place fries onto a lined baking sheet and brush with olive oil, salt and pepper. Bake for about 35-40 minutes until fries are crispy on the outside and begin to brown. Remove from oven and set aside. Preheat your grill and remove the steak from the marinade bag. Grill to your preferred temperature. Slice steak into thin strips, then cut each strip into smaller chunks. On another lined baking sheet, place the fries into a heaping pile. Top with steak and shredded cheese. Place under the broiler for 2-3 minutes until cheese is melted. (Watch carefully so it doesn’t burn). Remove from oven, top with fresh guacamole and serve. If I made these for any party they would be gone in seconds!